More than 5,000 students are pursuing their higher education goals at Bemidji State University this year. Fall enrollment on the 30th day of classes shows 5,013 students attending Bemidji State, the school’s highest enrollment since 2012. BSU’s head-count enrollment is up 107 students from its Fall 2014 30th day enrollment of 4,906, a 2.2-percent increase. Enrollment for both undergraduate and graduate students has increased from last year. BSU has 4,739 undergraduate students this fall, an increase of just under one percent from last year, while graduate enrollment has jumped more than 31 percent to 274 students — BSU’s highest number of graduate students since 2011. A record 2,023 students are enrolled in online courses as online education continues to play an increasingly important role in the college experience. Nearly 14 percent of BSU’s 3,383 on-campus undergraduates are taking classes online, and it now has a record 1,087 off-campus undergraduates enrolled in online courses. Since 2009, BSU’s online enrollment has grown by nearly 73 percent. 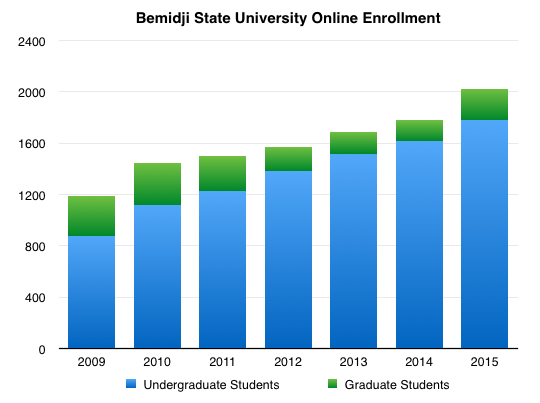 Bemidji State University announces fall enrollment figures on the 30th day of classes to coincide with official system-wide enrollment numbers generated by the Minnesota State Colleges and Universities. Reporting on the 30th day allows sufficient time for students to drop or add courses and to pay tuition.